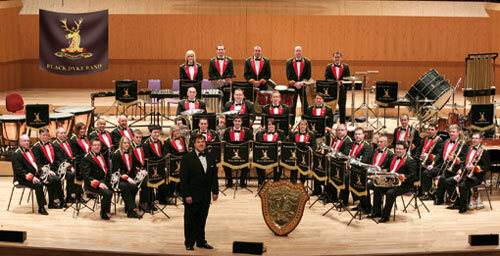 St. Joseph's Brass Band, Strabane is hosting the Black Dyke Band in concert at St. Patrick's Parish Centre on Friday 2nd Febuary 2008. The tickets are £15 each and are now on sale. Over the years the Black Dyke Band has produced an abundance of famous instrumentalists, in the formative years players such as Ceres Jackson, John Paley and Harold Pinches, were recognised as the very best. In recent decades, Rowland Jones, the Euphonium player, who had a wonderful voice, went on to become Principal Tenor at Sadlers Wells. It has to be said that his training in the brass band, particularly sight reading, was a tremendous advantage. Jack Pinches was Solo Trombone for Black Dyke at 16 years of age, he went on to become Principal Trombone in the BBC Symphony Orchestra. Two former Principal Cornets at Black Dyke, William Lang and Maurice Murphy achieved the position of Principal Trumpet with London Symphony Orchestra, William retired in 1995 and Maurice, said by many people to be the greatest cornet player ever, holds the position currently. Rod Franks a former cornet player with Black Dyke is also Principal Trumpet with the London Symphony Orchestra. Peter Graham is the Associate Conductor of Black Dyke Band, his introduction to brass music came as a young cornet player with the Ayr Salvation Army Band in his native Scotland. Deciding to make music a career he studied at Edinburgh and London Universities ( Goldsmiths College ) and holds a doctorate in composition. He enjoys an international reputation as one of the leading composers of music for brass band with over 100 publications to his credit, which include, The Essence of Time, Montage and On Alderley Edge. His latest work, Harrison's Dream, was commissioned by Boosey & Hawkes for the prestigious Millenium National Championships of Great Britain. Increasingly active as a guest conductor, he has worked in that capacity in many European countries, in the USA with the Star Lake and New York Staff Bands and regularly in England.